(StatePoint) When holiday hosting, don’t forget that while the right wines complement dishes, the wrong wines can ruin your best efforts. “The key is being mindful of your food’s sugar and acidity,” says Michael Trujillo, President and Director of Winemaking of Sequoia Grove Winery. With a combined 80 years of experience in Napa Valley winemaking, Sequoia Grove has learned what it takes to make a great food and wine pairing. Sweet or savory foods call for radically different wine pairings. Having the right Chardonnay and Cabernet Sauvignon on hand should satisfy most holiday dining situations. • Sugar and Cabernet Sauvignon, when mixed together on your tongue, create an explosion of acid, astringency and bitterness. White wines like Sequoia Grove Napa Valley Chardonnay will maintain their flavors when paired with sweeter dishes because of their naturally smoother profile. • Acidity and salt in food softens Cabernet Sauvignon’s robust texture. The flavors of a well-balanced wine, such as Sequoia Grove’s Napa Valley Cabernet Sauvignon, can be fully appreciated when paired with a savory dish. For the perfect Cabernet Sauvignon pairing, try this recipe for Grilled Leg of Lamb over Zucchini Ribbons with Mustard Sauce, from the food and wine experts at Sequoia Grove. • Preheat a gas grill to high heat. • Arrange lamb on a flat surface. • Combine rosemary, pepper, salt, and half the garlic in a small bowl. Stir in 1 tablespoon of olive oil. Spread over the non-fatty side of the lamb. • Cut the tops and bottoms off the zucchini. Use a vegetable peeler to cut the zucchini into thin ribbon-like strips. Stop and reserve the cores for another use. • Put the lamb on the grill, fatty-side up, cover and reduce heat to medium. Cook for seven minutes. Turn, reduce heat to low and cook for five minutes for medium rare or until the temperature of the thickest part reaches 130 degrees. Transfer to a cutting board and let rest five to 10 minutes. • Heat 2 tablespoons of olive oil and butter in a large skillet. Add remaining chopped garlic, crushed red pepper and the zucchini ribbons. Cook for about three minutes, then transfer to a bowl. • Return the skillet to medium-high heat and add the wine. Bring to a boil. Whisk in the mustard and remove from the heat. Add parsley and zucchini and toss to coat. • Cut lamb against the grain into thin slices. Arrange over zucchini. Sprinkle with salt and serve. More information on Sequoia Grove can be found at www.sequoiagrove.com. 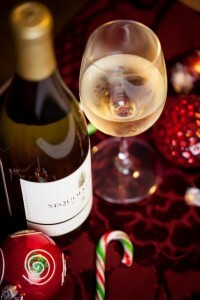 With the right wine and food pairings, you can give guests a reason to cheer this holiday season.